If light cannot escape from a black hole and if black holes are as small as Example 13.11 suggests, how can we know that such things exist? 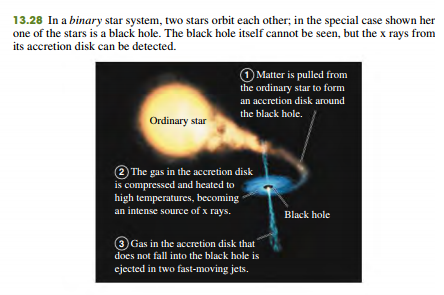 The answer is that any gas or dust near the black hole tends to be pulled into an accretion disk that swirls around and into the black hole, rather like a whirlpool (Fig. 13.28, next page). Friction within the accretion disk’s gas causes it to lose mechanical energy and spiral into the black hole; as it moves inward, it is compressed together. This causes heating of the gas, just as air compressed in a bicycle pump gets hotter. Temperatures in excess of 106 K can occur in the accretion disk, so hot that the disk emits not just visible light (as do bodies that are “red-hot” or “white-hot”) but x rays. Astronomers look for these x rays (emitted by the gas material before it crosses the event horizon) to signal the presence of a black hole. Several promising candidates have been found, and astronomers now express considerable confidence in the existence of black holes. 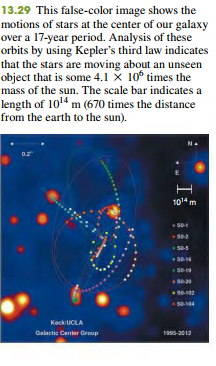 Black holes in binary star systems like the one depicted in Fig. 13.28 have masses a few times greater than the sun’s mass. There is also mounting evidence for the existence of much larger supermassive black holes. One example lies at the center of our Milky Way galaxy, some 26,000 light-years from earth in the direction of the constellation Sagittarius. High-resolution images of the galactic center reveal stars moving at speeds greater than 1500 km>s about an unseen object that lies at the position of a source of radio waves called Sgr A* (Fig. 13.29). The conclusion is that the mysterious dark object at the galactic center has a mass of 8.2 * 1036 kg, or 4.1 million times the mass of the sun. Yet observations with radio telescopes show that it has a radius no more than 4.4 * 1010 m, about one-third of the distance from the earth to the sun. These observations suggest that this massive, compact object is a black hole with a Schwarzschild radius of 1.1 * 1010 m. Astronomers hope to improve the resolution of their observations so that they can actually see the event horizon of this black hole. Other lines of research suggest that even larger black holes, in excess of 109 times the mass of the sun, lie at the centers of other galaxies. Observational and theoretical studies of black holes of all sizes continue to be an exciting area of research in both physics and astronomy.